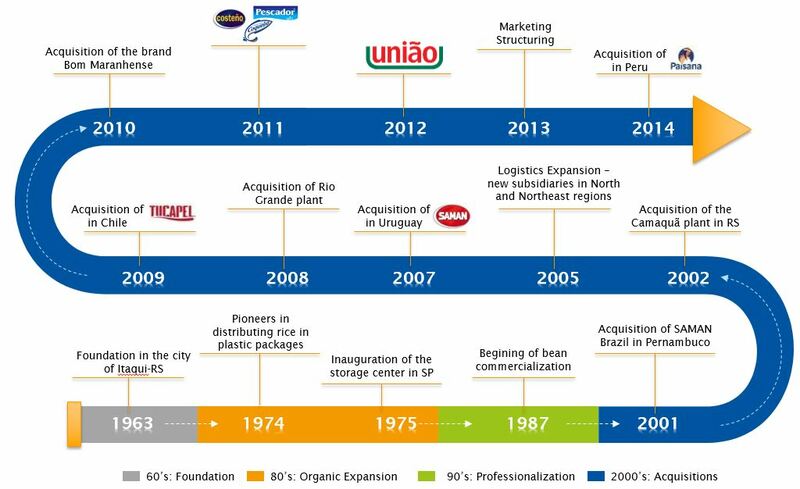 With over 50 years of history, Camil is one of the largest food companies in Brazil and Latin America, with a diversified brands portfolio in rice, sugar and fish segments as well as leadership positions in the countries where the company operates. Listed on 2017 in Novo Mercado, B3’s highest level of corporate governance, Camil has operations in Brazil, Uruguay, Chile, Peru and Argentina. The Company began its operations in 1963 in the state of Rio Grande do Sul, at a time when rice crops migrated from the center-west region to the southern region of Brazil due to this region’s higher productivity. In the 1970s, we expanded our operations to the state of São Paulo. In the 1980s, we started to pack and sell rice under the Camil brand and we opened our first distribution center in São Paulo. The 1990s were marked by (i) the growth of our business as we entered new markets, including the bean market; (ii) the transfer of our headquarters from the state of Rio Grande do Sul to the state of São Paulo; and (iii) the investment in our capital structure by TCW, a U.S. private equity fund. As of 2000, after the Quartiero family assumed our control, our expansion strategy has comprised acquisitions in addition to our organic growth. We acquired (i) Saman, in Uruguay, in 2007; (ii) Tucapel, in Chile, in 2009; (iii) BB Mendes, in the state of Maranhão, in 2010; (iv) Femepe Indústria e Comércio de Pescados S.A., or Femepe, (holder of the Pescador and Alcyon brands) and Canadá Participações Ltda. (holder of the Coqueiro brand), in Brazil, to diversify our portfolio by entering the canned fish market, and Costeño, in Peru, in 2011; (v) Docelar Alimentos e Bebidas S.A. (holder of the União and Da Barra brands), in the sugar market in Brazil, and Ormus (holder of the Hoja Redonda brand), in Peru, in 2012; (vi) Carreteiro Indústria e Comércio de Alimentos Ltda., in Brazil, La Loma Alimentos S.A., in Argentina, and Envasadora Arequipa S.A.C. (holder of the Arroz del Sur brand), in Peru, in 2013; and (viii) Romero Trading S.A. (holder of the Paisana brand), in Peru, in 2014. We operate in Brazil, Uruguay, Chile, Peru and Argentina. In Brazil, we are leaders in the rice market (Camil) and refined sugar market (União). We also rank first in the canned sardines market and second in the canned tuna market (Coqueiro) and second in the beans market (Camil), according to Nielsen/Scantrack in May 2017. Outside Brazil, we are a rice market leader in Uruguay (Saman), Chile (Tucapel) and Peru (Costeño). On August 1, 2016, WP Angra dos Reis Holdco S.A. (now WP XII e Fundo de Investimento em Participações Multiestratégia), a fund that is part of Warburg Pincus, one of the largest private equity managers in the United States, purchased the equity interest held by Gávea Investimentos in our Company. Prior to our Initial Public Offering, WP XII e Fundo de Investimento em Participações Multiestratégia held 31.75% of our capital stock and had two seats on our board of directors.